From its beginnings in the 1970s, the International Livestock Centre for Africa (ILCA) – a forerunner of the present-day International Livestock Research Centre (ILRI) – engaged in research designed for impact on development practice. Scientists were encouraged to work on the ground in the midst of livestock production systems – together with farmers, herders and other development actors. 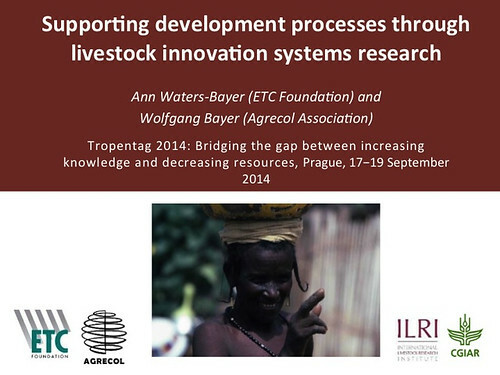 In this presentation, given at the Tropentag 2014 conference, Ann Waters-Bayer, a former ILRI researcher, looks back on her experiences of working with ILCA/ILRI and the impact of these experiences on her present-day work. Since leaving ILRI, Waters-Bayer has worked for the past 25 years with the ETC Foundation, a Netherlands non-governmental organization focused on strengthening links between research and development – both ‘formal’ and ‘informal’. But she retained contact with ILCA, later ILRI, in exploring innovative approaches in livestock sector development. The presentation, which she co-authored with Wolfgang Bayer from the Agrecol Association, gives an overview of the evolution from ILCA’s ‘livestock systems research’ in the 1970s and 1980s to ILRI’s ‘innovation works’ initiative and research in and on livestock-related ‘innovation platforms’. Waters-Bayer reflects on both the successes and challenges of the development-oriented approaches of ILRI’s research over the decades, with a particular emphasis to the social (including gender), economic and institutional aspects of research and development in smallholder mixed farming and pastoral livestock systems. According to Waters-Bayer, livestock innovation systems, in which relevant technical innovations related to livestock are embedded, can drive development processes that improve the livelihoods of rural and urban resource-poor families. Last week, ILRI staff participated in the Tropentag 2014 International Conference in Prague (17-19 September 2014). See all the posters and presentations and visit ILRI’s RebelMouse site for a collection of materials presented there. Tags: Ann Waters-Bayer, ETC Foundation, tropentag2014. Bookmark the permalink.